In part 4 I shared the first card people I made. I googled images of cards and found a set of fronts that I liked. Then did same for the backs. I used MS Word to insert the images. 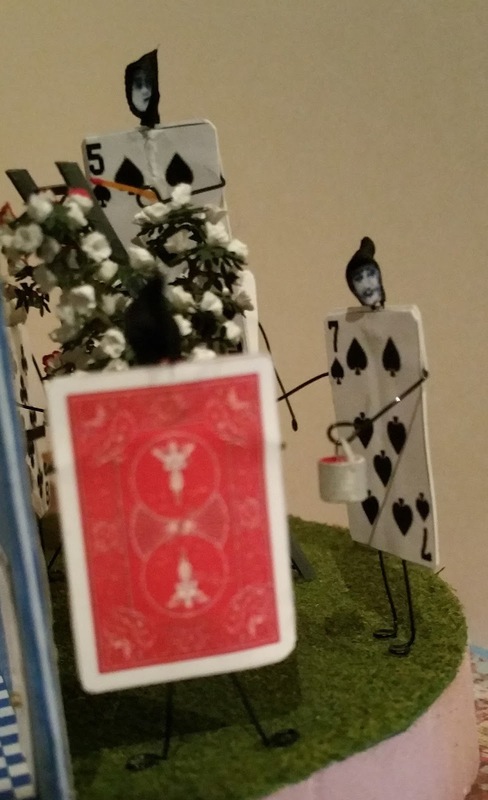 Then I re-sized them so that the cards were about an inch long. In hindsight, I might have gone a bit smaller, but rather than waste the ink, I used what I printed. I did print them on two pages as I did not care to deal with the alignment of two sided printing. 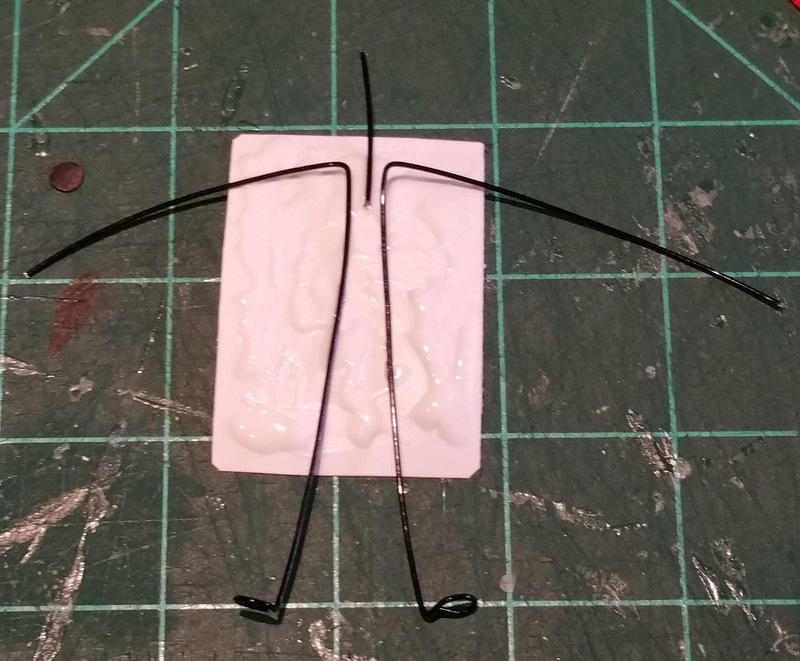 This also made it very easy to deal with the wire arms and legs and allowing them to be sandwiched in between. Once willing to have stick like 'people', it is easy to just have wires for their arms and legs. It is an easy step to the feet being circles and hands non-existent or even circles as well. The head is another decision altogether. I have done clay heads before and considered that, but paper heads would fit in with the paper bodies. One clever thing I think Lewis Carroll did is the use of the suites. 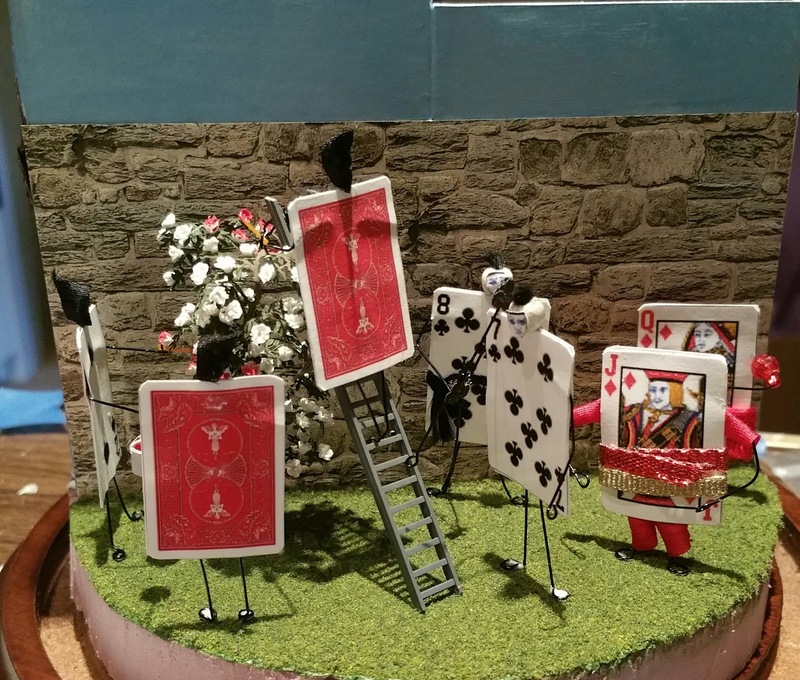 Spades are the gardeners, Clubs for the guards, Diamonds for the courtiers and then the Hearts are royalty. My problem came back to heads. The face cards have a face; the number cards do not. My ultimate decision was to use the face on face cards and add heads to the number cards. 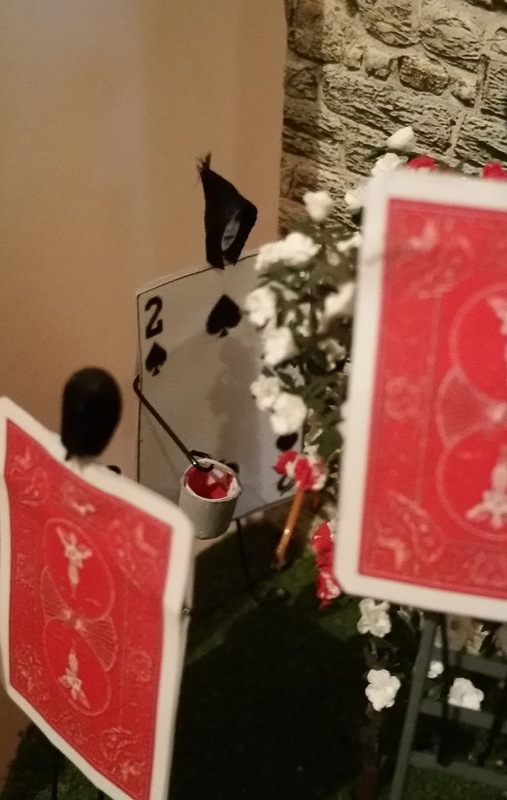 I used the faces from the spades and clubs for the number card heads. This worked out because I wasn't using all 52 cards, as in these are just extra. Plus there are two faces per card. I found it interesting that the faces were different not just by J, Q, K but also by suite. 1. 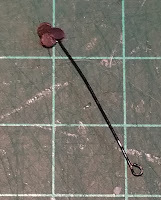 3 inch wire (26 guage black colored copper wire) for each side. 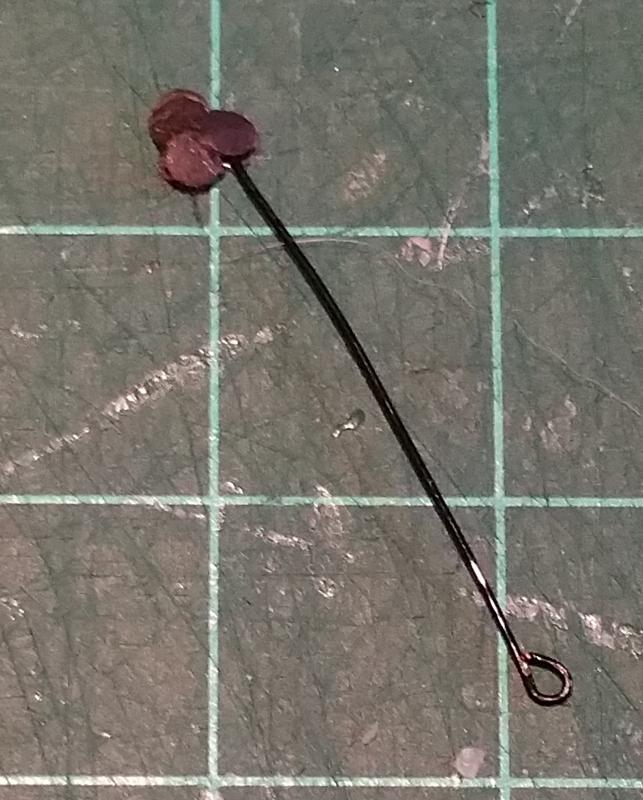 Plus 1/2 inch wire for head. 2. Made a circle for a foot and then bend for an ankle. Bend at the shoulder. 3. 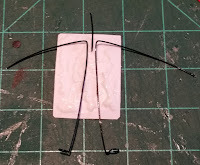 I applied glue to the back, laid on the arm/leg wires and a head wire. Then laid on the front and press together. I should have took this pic without the glue, every time I look at it, I think that the glue is going to dry out. 4. I removed the head wire. Wasn't trying to glue it in place just yet, but did want the space for it. 5. Used one of the faces cut from a face card,glue to wire and add a covering. For some this was ribbon, some was bead with the face glued on. 6. Glued the head in place - trimming wire as needed. Optional - to make the diamond cards have more depth, I added a roll of paper inside before I did step 2 and 3. The wires for the legs then had to go through the roll. Also I skipped the head wire since I wasn't adding one. Some of the trims for the diamond cards was added before the two cards were glued together. 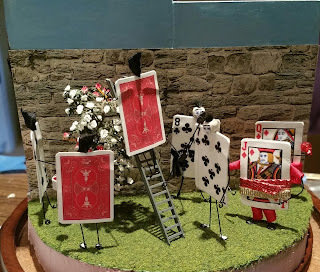 -These were made by cutting a strip of paper, rolling it up and gluing it together. 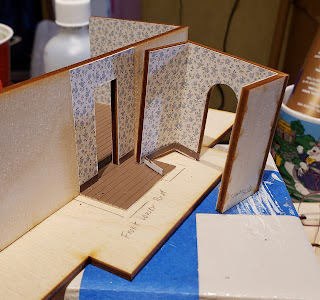 Then I glued the roll to paper. After it had a chance to dry, I cut around the roll. I painted the outside grey and added red inside. Then I added a handle. The handle is also paper. I cut a very very thin strip from the edge. These were made from black paper I punched - 6 circles glued to a wire that I added circles to both ends. Arms then were bent to hold the clubs in place. I also added a belt to one of the soldiers I am sharing today. I made a couple others with more trim added. Will show them later on. The Courtiers (diamonds) got fancied up with various trims. Notice they do not have heads added. The card people were so much fun to make, especially when I got to play around with adding trims and such. The Hearts aren't done yet. Figured I could share that later.